The focus of this ‘yawn-sigh’ exercise is to help clients phonate without deliberately forcing or pushing the voice. Clients should be encouraged to identify for themselves the relaxed, easy phonation and the absence of any resistance or blocks to producing voice. They can be reminded that the vowels are ‘open’ sounds, i.e. there is no blockage in the vocal tract during their production. The vocal tract should be relaxed and open. Now gently expel the air as if sighing – this should create a sensation of ‘letting go’; release the breath in a relaxed and easy manner. Repeat steps 1-2 three times. Now, take in another easy, relaxed breath through the mouth while yawning. Gently expel the air as if sighing but this time, on the out breath, gradually shape the first vowel sound oo – this should not be forced in any way. Repeat steps 4-5 three times. 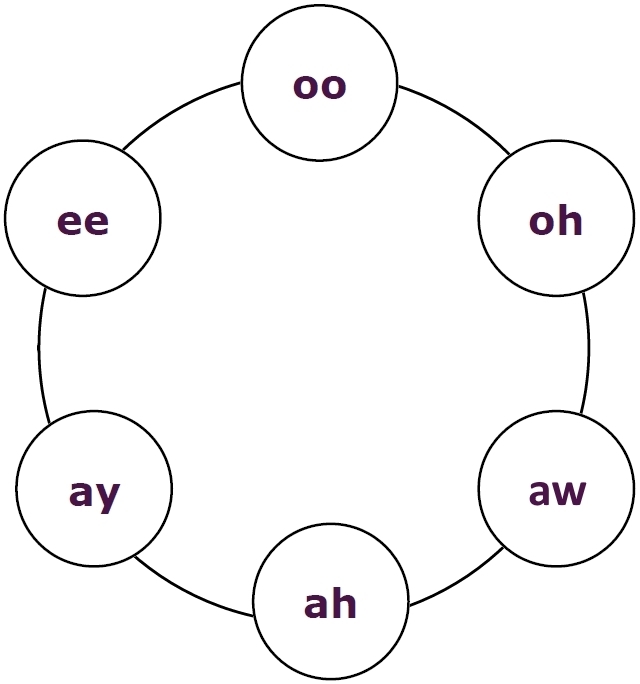 Repeat steps 4-6 with each of the remaining vowel sounds in the vowel wheel, i.e. oh, aw, ah, ay, ee. 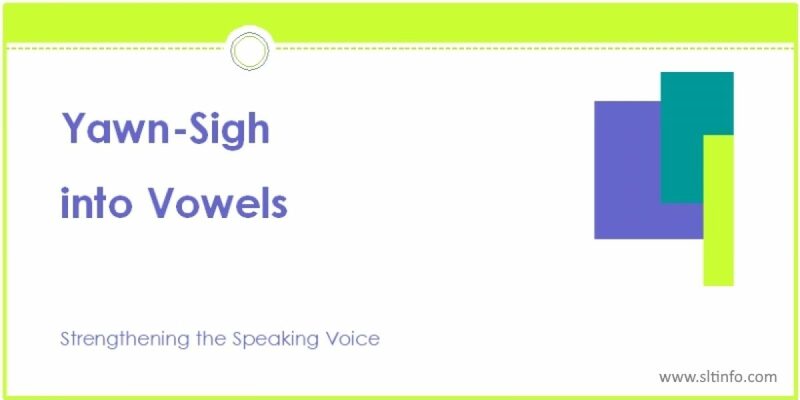 For further practice, begin at the top of the vowel wheel with oo and then work your way around the wheel clockwise, yawning-sighing-shaping each vowel in turn. Notice sensations of relaxation and openness, and that there is no blockage to production of the voice. Do this three times. Remember: voice exercises are gentle and there should be no forcing or straining — you should also be using abdominal breathing throughout.